After Joseph Petzval introduced his iconic lens in 1840, portrait photography flourished. 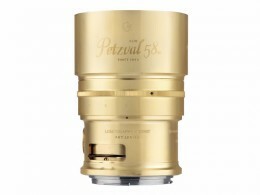 We've taken the best features of the Petzval Art Lens to the next level: The new Petzval 58 Bokeh Control Art Lens comes with an unprecedented Bokeh Control Ring paired with a versatile 58mm focal length. Together with an f/1.9 maximum aperture, these traits will let you explore new photographic paths. Boasting a solid satin-finished brass body, the Petzval 58 Bokeh Control Art Lens is great for all different types of photography. From captivating portraits and busy streets scenes, to impressive architecture and wide landscapes, every image showcases harmonic color saturation and fine contrasts. In the past, the Petzval's swirly bokeh effect has always been strongly dependent on factors such as the types of backgrounds you shoot against and the distance between you and your subject. With the Petzval 58 Bokeh Control Ring, you can now achieve purely sublime swirl in all kinds of environments and shooting conditions. But if you want to achieve a more powerful swirly bokeh effect than you've ever known before, turn it to Level 7 and watch the world transform right in front of your eyes. The way the Bokeh Control Ring works is deceptively straightforward.